On September 29, Phase II of the move to the new building was complete. One family shared with us some very special memories of that day. "When I was pregnant, we learned that our baby had a heart condition that would be fatal without intervention. We did our research and learned that Texas Children’s was ranked No. 1 in the country for cardiology and heart surgery by U.S. News & World Report. We relocated to Houston because we knew that it would be the best place to give our baby a chance at life. Oliver was born at the Pavilion for Women and had his first surgery when he was only seven days old. His case has been complicated, and he has remained in the cardiovascular intensive care unit (CVICU). Texas Children’s is the only home he has ever known. The move to the new Lester and Sue Smith Legacy Tower is a highlight in our journey. On move day, Oliver was the very last one to leave West Tower’s cardiac unit, and he was treated like a celebrity. There was a lot of fanfare as we made a final lap around the old unit, wheeling past countless people who have invested a piece of themselves in our baby. 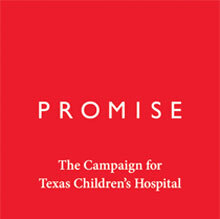 Funds raised through Promise: The Campaign for Texas Children's Hospital will provide support for the construction of a new, 19-floor pediatric tower. We will build new and larger pediatric intensive care units (PICUs) and cardiovascular intensive care units (CVICUs), moving them from their current location in the West Tower, significantly increasing the total number of critical care beds available. These rooms will be specially designed and configured so that parents can stay with their child overnight and so that all necessary equipment is easily accessible for caregivers. We will add more operating rooms (ORs) that are larger and more flexibly designed to accommodate patients who require the most complex procedures. These, too, will be moved from the West Tower. Relocating the PICUs, CVICUs and ORs will free up space for the West Tower, where the Emergency Center (EC) is located, to completely redesign the EC so that patients can be triaged and treated more quickly and efficiently. Before Lester and Sue Smith Legacy Tower opened, our ICU was almost always at or over 100% capacity. Now, the average capacity is in the low 90% levels. This is where it should be so we have room to accept transfers of critically ill patients from other hospitals and to move our own patients into critical care if they need it. On May 22, 2018, the move to the Lester and Sue Smith Legacy Tower began with seven clinical teams safely transporting 45 critically-ill patients to their new, spacious, state-of-the-art critical care rooms. More than 150 Texas Children's staff members were involved in the move, and the careful transfer of the patients took seven hours. The Lester and Sue Smith Legacy Tower houses new and expanded operating rooms, as well as a new PICU that spans four floors and 84 beds, including dedicated neurology ICU rooms, surgical ICU rooms, and a progressive care unit. Texas Children's Heart Center, ranked #1 in the nation by U.S. News & World Report in cardiology and heart surgery, is now located at the Lester and Sue Smith Legacy Tower. There have been 1,258 operating room cases including 120 cardiovascular OR cases and 148 cardiac catheterization procedures. On November 7, 2018, the final piece of the 19-floor pediatric tower named the Lester and Sue Smith Legacy Tower was in place when we celebrated the opening of the helistop on the roof, enabling the transport of the most critically ill patients to Texas Children's Hospital.